Cami de la Villalonga, 16, 07100 Soller, Spanje. 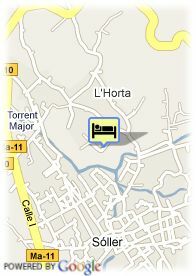 Hotel Ca'n Quatre is located in Soller Valley. It invites customers to have a rest and enjoy the natural environment in a rural house. The hotel is surrounded by a lush and a well cared garden which is ideal for reading or for a walk or rest. It offers 10 rooms, all of them decorated in an original way. There is a restaurant, a social lounge, outdoor swimming pool and solarium.